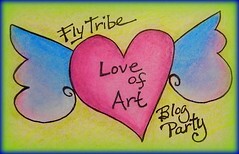 As you may already know, I will be a guest instructor for "Life Book 2013," a year long art journaling workshop, hosted by Tamara Laporte of Willowing. I’m excited to announce I'm holding a GIVEAWAY for one FREE SEAT in "Life Book 2013!" GIVEAWAY from Joann Loftus Studios for a FREE seat in LIFE BOOK 2013!! Step Two: Come back to THIS PAGE and let me know what you did. Include a link to wherever you posted (Facebook, Blog and/or Twitter). Each post counts as an entry, which increases your chance of winning, so post away! I will combine all enteries from this blog, along with the entries made on my Facebook Page, and one name will be randomly drawn on Wednesday, October 31st. If you haven't already, please follow this blog, "Like" my Facebook Page, and follow my YouTube Channel. That way, you'll always be getting my latest news and updates! Dale & I decided to also help stimulate the economy this week and bought several new appliances for the kitchen. We got a GE Profile Induction Cooktop with Convection Oven, a GE Advantium Convection/Microwave, and a Bosch Dishwasher. Never in a million years could you have convinced me twenty years ago that I'd actually be excited to get something as mundane as new kitchen appliances, but I am! It's such a huge improvement from what we've had, I know we'll love it. Hopefully, in the spring we'll be ready to completely remodel the kitchen with new cabinets, countertops, flooring and refrigerator. But for now I'm just excited to have a stove that has more than two working burners. Maybe now I'll cook.... or not. But at least it will look pretty when I get up in the morning to fix my coffee. I can sit and look and it and admire the shiny, new stainless steel. My oldest daughter, Monica, held an art journaling workshop this week, so I got to play every day! I did lots of painted background pages, some collaged and doodled borders, and part of a zentangle finished. Plus, I got one journal page finished... unless, of course, I decide to do some more doodling here and there around the outside edges... which is highly likely! We had lots of fun and Monica did a great job of introducing new student to art journaling and teaching the class all sorts of journaling techniques and ideas! I'm thrilled and excited to announce I will be TEACHING for ”Life Book 2013” an online collaborative art workshop!!! Twenty-two instructors from across the globe will bring new and exciting mixed media art and journaling techniques twice a month for an entire year, including our host instructor, Tamara Laporte (willowing). Anyone who likes to paint, create, doodle, collage, hand letter and PLAY with simple art supplies will LOVE this workshop! There will be lots of videos with tons of creative ideas, as you're guided step-by-step to create your own beautiful art journal. All of the instructors for ”Life Book 2013” are wonderfully talented artists, each with their own distinct style. As this will be my first experience with teaching online, I'm honored to be in such outstanding company! I hope you will join us on this year-long journey of self discovery and creativity.